This paper analyses the changing use of shot scales and shot types in the films of Alfred Hitchcock from The Pleasure Garden (1925) to The Birds (1963) in the context of the introduction of sound technology to British cinema in 1929 and the director’s move from Britain to Hollywood in 1939. A sample of 42 films was divided into 3 subgroups (British silent films [𝑛 = 9]; British sound films [𝑛 = 14]; and Hollywood films [𝑛 = 19]); and was analysed using linear regression of rank-frequency plots and nonparametric analysis of variance. The results show that all three groups of films are well-fitted by a linear regression model, with no one shot scale dominating these films. Analysis of the different shot scales revealed that there are no significant differences in the use of shot scales between the two groups of British films, but that significant differences did occur between the British and American films for close-ups and medium close-ups, which increase in frequency, and medium long shots and long shots, which became less frequent. The proportion of reverse-angle cuts in the Hollywood films is much greater than in the British films, and this may be due to the use of shot-reverse shot editing patterns in Hollywood cinema. There is no evidence that the number of point-of-view shots or inserts changed, and this may be attributed to the fact that these types of shots are used in specific circumstances as required by the demands of narrative. Overall the results indicate that the introduction of sound technology did not have an impact on Hitchcock’s film style, but that the move to Hollywood did result in specific changes in the style of Hitchcock’s films. This paper expands and imporoves on the methodology of using rank-frequency plots and ranks to analyse shot scales that I’ve used elsewhere. It also clarifies and updates and earlier discussion of shot scales in Hitchcock’s films, as well as tentatively exploring the relationship between reverse-angle cuts and POV shots. There is, however, much work to be done in this area – especially on Hitchcock’s use of shot-reverse shot editing. The shot length data for the three Laurel and Hardy films that I refer was collected by me as part of a larger study, and when I finally finish it off I will post the draft of my Laurel and Hardy essy along with the complete shot length data for all the films I have looked. Croux C and Rousseeuw PJ 1992 Time-efficient algorithms for two highly robust estimators of scale, Computational Statistics 1: 411-428. Daszykowski M, Kaczmarek K, Vander Heyden Y, and Walczak B 2007 Robust statistics in data analysis – a review: basic concepts, Chemometrics and Intelligent Laboratory Systems 85: 203-219. Gorard S 2004 Revisiting a 90-year-old debate: the advantages of the mean deviation, British Educational Research Association Annual Conference, University of Manchester, 16-18 September 2004: http://www.leeds.ac.uk/educol/documents/00003759.htm, accessed 15 July 2010. Rousseeuw PJ 1991 Tutorial to robust statistics, Journal of Chemometrics 5: 1-20. Rousseeuw PJ and Croux C 1993 Alternatives to median absolute deviation, Journal of the American Statistical Association 88: 1273–1283. In an earlier post I mentioned I was looking at the distribution of shot lengths in the two versions of Blackmail (1929), along with several of Alfred Hitchcock’s late-silent and early sound films, and today’s post is the first draft of that paper. The abstract is below, and the pdf can be download here: Nick Redfern – Shot length distributions in the films of Alfred Hitchcock, 1927 to 1931. 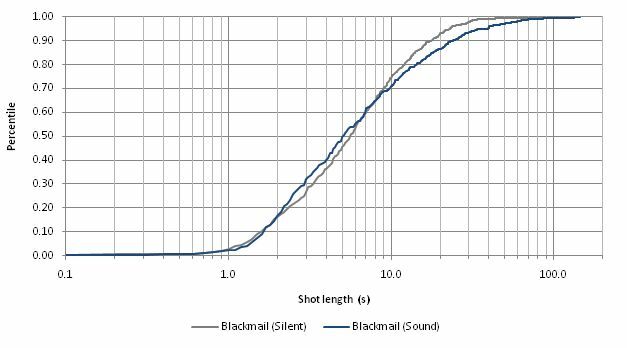 The shot length distributions of the silent and sound versions of Blackmail (Alfred Hitchcock, 1929) are analysed in to determine if the introduction of synchronous sound technologies led to a difference in film style. The two versions of this film are then analysed along with four of Hitchcock’s silent films prior to the filming of Blackmail and four of his early sound films. The results show that there is no significant difference in the shot length distributions of the two versions of Blackmail at any point (Kolmogorov-Smirnov: D = 0.07, p = 0.19). Putting Blackmail into the context of Hitchcock’s late silent and early sound films from 1927 to 1931, there is no significant difference in the median shot lengths (Mann Whitney: U = 4.5, p = 0.12), but there is a significant difference in the interquartile ranges (Mann Whitney: U = 0.0, p = 0.01). 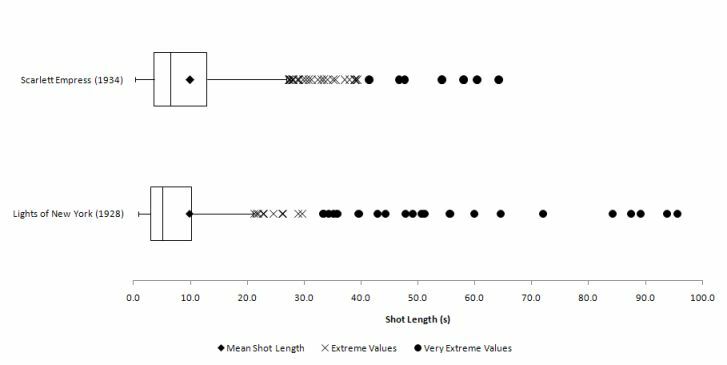 Closer inspection of this change in the dispersion of shot lengths reveals that there is no significant difference in the lower quartiles of these films (Mann Whitney: U = 10.0, p = 0.66) but there is a significant change in the upper quartiles (Mann Whitney: U = 0.0, p = 0.01). The impact of sound on Hitchcock’s style can, therefore, be seen in the increase in the dispersion of shots above the median rather than in the distribution overall. Comparing the interquartile ranges for the ten films it is possible to sort them into three groups: the late sound films, the two versions of Blackmail, and the early sound films. The results show that there is no difference in the distribution of shot lengths between the two versions of Blackmail due to the unique circumstances of production and that as silent-sound hybrids they represent a transitional phase between Hitchcock’s ‘pure’ silent pictures and his ‘pure’ sound films.